Located on the beautiful Soliman Bay, Villa Lol Beh is a premier luxury home that will make your vacation an extraordinary experience. Lol Beh means ”Flower Path” in Mayan. Inspired by dramatic, natural tropical elements and beautiful landscapes this one-of-a-kind Villa offers guests dramatic views of the Caribbean beach. This classic Hacienda-style home benefits from warm off-shore breezes and lots of sunshine. The exceptional design creates an outstanding centerpiece for the beachside of the property. World-class accommodations and service provides guests with a spectacular vacation experience. This newly built estate is surrounded by indigenous flora and fauna, palms, flowering vines and shrubs all native to this tropical Caribbean region of Mexico. Spectacular 12 feet ceilings, 2 stylish living rooms, 8 large bedrooms and a blend of Mexican and European decor, this world-class rental property awaits your next visit. Situated on the beachfront on the quiet shores Soliman Bay, this vacation villa is a definite top accommodation choice for large groups and family gatherings as it can accommodate up to 24 guests. On the day you arrive dinner will be waiting. Then each morning enjoy a fresh continental breakfast. Chef service is included so if dining in Tulum sounds like too much effort indulge yourself and have dinner prepared specially for you and dine by the pool. Spend your days by the beach patio, make a splash in the fabulous swimming pool and enjoy the great outdoors in the cozy sofas, chaise lounges, chairs and a long pool-side dining table. You are also centrally located to enjoy day-tripping to the Mayan ruins of Tulum, play golf, go scuba diving or just relax and enjoy the sun. Villa Lol-Be comprises luxurious bedrooms. Six of them are located in the main villa, while the remaining two bedrooms are part of a separate guest house for additional privacy and comfort. Each bedroom suite pampers its guests with fine king-size and queen size beds, airy en-suite bathrooms, flat screen TVs with SKY cable and private security safes. Two bedrooms are located on the main floor of the villa, 3 second floor bedroom suites open up onto raised views of Soliman Bay. 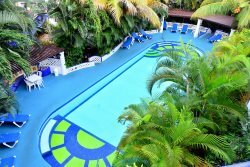 And two third floor bedrooms have king beds, and the best views of the Caribbean Sea. 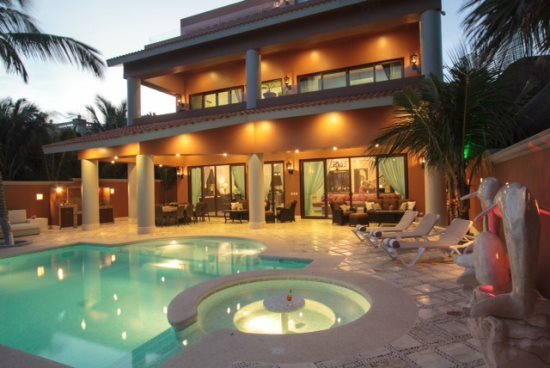 This villa offers a sumptuous and indulgence unlike any of the other villas in the Riviera Maya. Extra living space for retreats, family reunions and weddings. The guesthouse of Villa Lol Be provides the extra space to accommodate larger groups and has the attention to detail makes the guesthouse suites simply divine. It features deluxe interiors, a private terrace, small kitchen and two comfortable bedrooms, each furnished with a king-size bed and a double bed. Villa Lol Beh is magnificently crafted, and exude a feeling of sophistication and elegance. •Guesthouses have a mini fridge, sink and coffee makers. •Please note: No smoking inside the villa. •4 with king, 2 with 2 queens. Base rate is for 10 guests accommodated in main house only. Add $500 per person over the base number of 10 guests. Accidental Rental Damage Insurance or Security Deposit of $1000 is required. Note: No smoking inside the villa.